Located in Elysburg, Pennsylvania, Knoebels Amusement Resort is the largest free-admission amusement park in the United States, offering a variety of high and mild thrill rides, a pool and water park, an 18-hole championship golf course, and a picnic grove and campground area. The area that now encompasses Knoebels Amusement Resort was popularly called “Peggy’s Farm” in the early 20th century, known as a picnic and resort destination for its natural creek swimming hole and its scenic wooded valley. As the area’s popularity as a tourist attraction grew, local farmer Henry Knoebel began selling concessions in the area and later leased a number of plots of area land for summer cottage use. Knoebel expanded the area’s attractions in 1926, building a restaurant and adding a steam-powered carousel and several amusement games, earning the area the nickname “Knoebel’s Grove.” The same year, he renovated the area’s swimming hole into a concrete swimming pool named the Crystal Pool, equipped with a modern filtration system. Throughout the 20th century, the Knoebel family continued to develop the park, adding a variety of modern amusement rides and games. In 1962, a six-site campground was opened adjacent to the park, which has expanded to cover more than 160 acres. A number of park attractions have been replaced or renovated due to repeated flooding throughout the later part of the 20th century. Today, Knoebels Amusement Resort spans throughout Northumberland and Columbia Counties in southeastern Pennsylvania, located near South Branch Roaring Creek. More than 60 amusement rides are offered at the park, including several rides which have won awards from the International Association of Amusement Parks and Attractions and Amusement Today. The park was ranked by the Travel Channel in 2014 as one of the top 10 family-friendly parks in America and has been featured on the Discovery Channel and other major television programs. As the largest free-admission park in the United States, visitors may purchase individual ride tickets, limited-access hand stamps, or all-day amusement wristbands. A variety of high-thrill rides are offered at the park, including the classic Phoenix wooden coaster, which was opened at the park in 1985 after being rebuilt from San Antonio’s Rocket coaster, and the Twister wooden coaster, offering a dark tunnel and double helix. The Impulse steel coaster offers four inversions, including a zero-g roll and a cobra roll, and a 90-degree vertical lift hill, while the Flying Turns, the only wooden bobsled coaster in the world, offers hairpin turns along a gravity-controlled slope course. The park’s award-winning Haunted Mansion ride has been named a top American dark attraction by Dark Ride and Funhouse Enthusiasts for over a decade. Other thrill rides include the Fandango pendulum ride, the StratosFear drop tower, and the Cosmotron indoor dark Himalaya ride. Several classic water rides are offered, including a Giant Flume and the Skloosh flatboat ride. 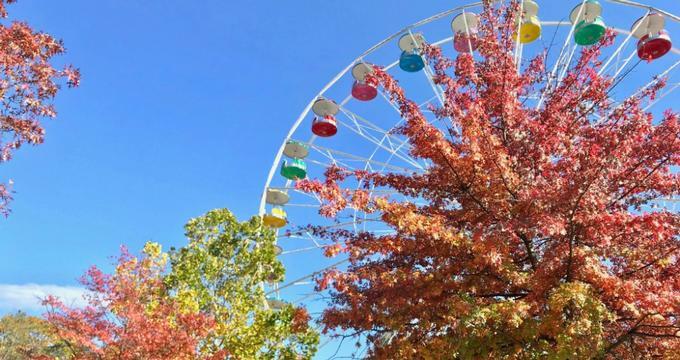 Classic midway rides for families include a Looper rolling ride, a Paratrooper ride, an Italian Trapeze swing ride, a Giant Wheel, and a Scenic Skyway aerial skylift. Two carousels are located within the park, including the 63-horse Grand Carousel, one of the largest remaining classic carousels in the world, which was built in Brooklyn in 1913 and purchased by the park in 1942. Two miniature railways are also offered, including the Old Smokey Train, which is helmed by a 1960 Crown Metal Products steam locomotive. More than 20 children’s rides are offered, including miniature Himalaya, Ferris wheel, and bumper car rides. In addition to amusement rides, a variety of family attractions are offered throughout the park, including a Carousel and History Museum, which showcases the park’s history and development along with its collection of classic carousel horses and figures. A Mining Museum also features local mining artifacts from the collection of area resident Clarence "Mooch" Kashner. A Bald Eagle Habitat offers educational sessions with resident birds of prey and their handlers, and an Americana craft and trade area provides demonstrations of classic steam-powered tools. A miniature golf course, laser tag arena, children’s play area, and several arcades are also located throughout the park. The park’s Crystal Pool is open from Memorial Day through Labor Day, offering a variety of slides and water rides surrounding its 900,000-gallon central pool area. Adjacent to the park, Knoebels Three Ponds Golf Club offers a regulation 18-hole championship par-71 golf course and casual dining at the Nickel Plate Bar and Grill. The park is noted for its dining options, which have been the recipient of multiple Best Food Golden Ticket Awards from Amusement Today and include the full-service Alamo Restaurant, the counter-service Cesari’s Pizza, and an International Food Court. Overnight accommodations at the park include the 600-site Knoebels Campground, the nearby Lake Glory Campground, 16 summer-use cottage rentals, and the five-room Latorre House Bed and Breakfast, located near the entrance to the park.